Nordic flags, from left to right: the flags of Finland, Iceland, Norway, Sweden and Denmark, respectively. A selection of official, in-use Nordic Cross flags in Northern Europe region. Smaller flags, from left to right: South_Uist, Yorkshire West Riding, UK, Orkney, Shetland, Scania, Åland, Parnu, Setomaa, Vepsians. The Nordic cross flag is any of certain flags bearing the design of the Nordic or Scandinavian cross, a cross symbol in a rectangular field, with the center of the cross shifted towards the hoist. All of the Nordic countries except Greenland have adopted such flags in the modern period, and while the Scandinavian cross is named for its use in the national flags of the Scandinavian nations, the term is used universally by vexillologists, in reference not only to the flags of the Nordic countries but to other flags with similar designs. The cross design represents Christianity, and the characteristic shift of the center to the hoist side is early modern, first described the Danish civil ensign (Koffardiflaget) for merchant ships in a regulation of 11 June 1748, which specified the shift of the cross center towards the hoist as "the two first fields must be square in form and the two outer fields must be ​6⁄4 lengths of those". The Danish design was adopted for the flags of Norway (civil ensign 1821) and Sweden (1906), both derived from a common ensign used during the Union between Sweden and Norway 1818–1844, as well as Iceland (1915) and Finland (1917); some of the subdivisions of these countries used this as inspiration for their own flags. The Norwegian flag was the first Nordic cross flag with three colours. All Nordic flags may be flown as gonfalons as well. Note that some of these flags are historical. Also, note that flag proportions may vary between the different flags and sometimes even between different versions of the same flag. The Flag of Greenland is the only national flag of a Nordic country or territory without a Nordic Cross. When Greenland was granted home rule, the present flag - with a graphic design unique to Greenland - was adopted on June 1985, supported by fourteen votes against eleven who supported a proposed green-and-white Nordic cross. Naval ensign of Denmark (17th century). Note the darker kraprød colour (1939). Naval ensign of Norway since 1905, civilian state flag since 1899. Former flag of Norway (1814–1821). The common naval ensign and war flag of Sweden and Norway from 1815 to 1844. Merchant flag of Norway 1844–1898 with the union badge representing the union with Sweden. Naval ensign and state flag of Norway 1844–1905. Historical Flag of the Kalmar Union, which united Denmark, Sweden and Norway 1397 to 1523. No pictorial evidence survives of the Kalmar Union's Flag. The flag appearing here is a reconstruction based on references in 1430 letters by King Eric of Pomerania. These flags either do not have official status or represent various private entities. They have not been officially adopted and their use remains limited. Proposal for a flag of Greenland, designed in 1984 by Sven Tito Achen. Rejected in favour of the non-Nordic-Cross flag. Flag of Norwegian fascist party Nasjonal Samling 1933–1945. A proposed flag for Estonia. A proposed flag for Estonia (1919). Nordic flag designs very similar to Denmark's, Sweden's, and Norway's national flags were proposed as Germany's national flags in both 1919 and 1948, after World War I and World War II, respectively. Today, the Nordic cross is a feature in some city and district flags or coats of arms. Flag of the Danish monarch, flown in his capacity as Duke of Holstein, Schleswig and Lauenburg. The three duchies were ceded to Austria and Prussia in 1864 as a result of the Second Schleswig War. Proposed National flag of Germany, circa 1919. A number of flags for localities in the United Kingdom (primarily Scotland) are based on Nordic cross designs, intended to reflect the Scandinavian heritage introduced to the British Isles during the Viking Age and through the High Middle Ages. Royal Standard of Greece (1863). Note: George I was also a prince of Denmark. Former official flag of East Karelia, designed by Akseli Gallen-Kallela. ^ Jeroen Temperman. State Religion Relationships and Human Rights Law: Towards a Right to Religiously Neutral Governance. Martinus Nijhoff Publishers. p. 88. Retrieved 2007-12-31. Many predominantly Christian states show a cross, symbolising Christianity, on their national flag. The so-called Scandinavian crosses or Nordic crosses on the flags of the Nordic countries–Denmark, Finland, Iceland, Norway and Sweden–also represent Christianity. ^ Carol A. Foley. The Australian Flag: Colonial Relic or Contemporary Icon. William Gaunt & Sons. Retrieved 2007-12-31. The Christian cross, for instance, is one of the oldest and most widely used symbols in the world, and many European countries, such as the United Kingdom, Norway, Sweden, Finland, Denmark, Iceland, Greece and Switzerland, adopted and currently retain the Christian cross on their national flags. ^ Andrew Evans. Iceland. Bradt. Retrieved 2007-12-31. Legend states that a red cloth with the white cross simply fell from the sky in the middle of the 13th-century Battle of Valdemar, after which the Danes were victorious. As a badge of divine right, Denmark flew its cross in the other Scandinavian countries it ruled and as each nation gained independence, they incorporated the Christian symbol. ^ "Nu vajer det grønlandske flag over Danmark". Retrieved 2016-06-24. ^ "Kunstavisen på internettet – Artikler". Archived from the original on 2 October 2008. ^ In 1844, pro-German nationalists in the two duchies of Holstein and Schleswig created a blue-white-red tricolour as a symbol for independence which began to see widespread use. In 1845, Denmark responded by outlawing all other flags than the Danish one shown here. This ban was enforced as long as Denmark controlled the three duchies (Holstein and Lauenburg: effectively until 1863, Schleswig effectively until 1864.) Use of the Danish flag was in turn outlawed by the secessionist government that claimed the three duchies between 1848–1851. ^ "Grand Duchy of Oldenburg 1815-1918 (Lower Saxony, Germany)". Flagspot.net. Retrieved 28 December 2017. ^ "South Uist flag". Hebrides-news.com. Retrieved 28 December 2017. ^ "Isle of Barra's flag officially recognised". BBC News. Retrieved 26 May 2018. ^ "New flag represents area's Viking history". Scotsman. Retrieved 18 December 2018. ^ Пюккенен, А. Ю.; Сыров, А. А. (2002). Что такое Ингерманландия? Краткое введение в историю ингерманландских финнов [What is Ingria? A short introduction to the history of the Ingrian Finns] (in Russian). Saint Petersburg. ^ Пюккенен, А. Ю. (2011-05-30). "Геральдика Невского края" [Neva region heraldry]. Санкт-Петербургские ведомости (in Russian). Saint Petersburg: АО Издательский дом «С.-Петербургские ведомости». ^ "Hur ser Svenskfinland ut om 100 år?" (PDF). Medborgarbladet (in Swedish). Helsinki: Svenska folkpartiet RP. 61 (4): 20. December 2006. Archived from the original (PDF) on 2011-07-21. Retrieved 2008-06-06. ^ Engene, Jan Oskar (10 March 1996). "Swedish speaking population in Finland". Flags of the World. Retrieved 6 June 2008. ^ "Interfrisian flag". Groep fan Auwerk. Retrieved 1 December 2015. Znamierowski, Alfred (2002). The world encyclopedia of flags : The definitive guide to international flags, banners, standards and ensigns. London: Hermes House. pp. 103 and 134. ISBN 1-84309-042-2. 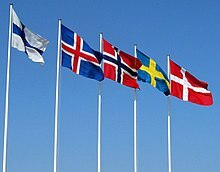 Wikimedia Commons has media related to Nordic Cross flags. Extensive compilation of official and non-official Nordic Cross flags (at Flags of the World). This page was last edited on 14 April 2019, at 18:13 (UTC).